This post will take a look at all of the different Martin X Series acoustic guitars. CF Martin & Company has been in the guitar making business for over 180 years and have been at the forefront of many acoustic guitar innovations. Their X Series guitars may be on the lower end of Martin’s guitars in terms of price but even Martin’s lower end guitars are high quality and the X Series is testament to that. And you’re still looking at an MSRP of around $729 (USD) for the cheapest X Series model – Martin isn’t focused on budget priced guitars – their focus is on quality acoustic guitars and that shows in even their lower end (for them!) X Series models. O.k. so those names sound confusing and there are a lot of different guitars there. Which is the best option? Let’s break down each guitar so that you can learn more about each guitar and the differences between each model. It’s not too difficult once you break it down. Starting with the Dreadnought models let’s take a look at the DX1AE. To make the name easier to understand let’s see what the letters and numbers stand for. With so many manmade or unfamiliar materials it’s easy for some to dismiss the X series guitars. But once you play one (check out my full review of the DX1RAE for more) then you’ll realize that, whatever they are doing with the materials, it works. Plus, using some of those materials makes these guitars better for the environment. The sound and playability of these guitars (at least the ones that I’ve had the pleasure of playing) for under $1,000 is awesome. I loved this guitar when I had the chance to demo it. Check out my review at the link below. This guitar is virtually the same as the DX1AE (first guitar in this list) except that it has East Indian Rosewood HPL back and sides. Whilst the HPL Rosewood won’t affect the sound as much as Solid Rosewood would, it still makes a difference. The HPL Rosewood back and sides will help to produce more pronounced lows and highs and more overtones compared with the HPL Mahogany, which will help to produce a subtly warmer, mid-range heavy tone with more subtle overtones. They’re the same price so the only decision really is if you prefer the sound and look of Mahogany or Rosewood. The DX1KAE is again pretty much the same guitar – except this time the pattern of the HPL is Hawaiian Koa. Again between the 3 the only real decision is whether you prefer the Mahogany, Rosewood or Koa sound and look. The DXAE is the cheapest of the models – the reason being (in my opinion) is that it doesn’t have a solid wood top. Apart from the top being HPL instead of solid Sitka spruce (the major difference), the DXAE Black has mostly the same specs as the DX1AE, DX1RAE and the DX1KAE, except for a few minor things. The DXMAE is very similar to the DXAE Black, except that it has a Sitka Spruce patterned HPL top in place of the black one, the nut and saddle are white and the back and sides are Mahogany patterned HPL. The decision between this one and the black version comes down to which you prefer the look of. If it were me I would pay the extra $50 to get a solid top (like on the DX1AE, DX1RAE and DX1KAE). The DXK2AE has Koa patterned HPL Top, Back and sides. This is the main difference between this and the DXAE Black and DXMAE. The DX2AE Macassar features a solid Sapele (Mahognay-esque tonewood) top and Macassar patterned HPL back and sides. The major difference here is the Solid Sapele top. This will help to produce a warmer, fuller, mid-range heavy type of sound – compared with the Sitka Spruce topped versions. The DCX1AE Macassar has a Solid Sitka Spruce top and Macassar patterned HPL back and sides. It is also the first of the models that we have looked that features a cutaway. Now we come to the 12 string model. The D12X1AE is has the same specs except that it is a 12 string guitar and this naturally also means that the nut width is slightly wider (to accommodate the extra strings) – it is 1 7/8” (1.875” – 47.6mm). Now we’re onto the Grand Performance models. These models are Martin’s Grand Performance size/shape. The GP shape has a more defined waist than the dreadnought model. It has a slightly smaller length, a slightly wider lower bout, a slightly shorter body length and a slightly shallower body depth. You can see the difference between the dimensions in the table below. As you can see the GPX1AE is very similar to the DX1AE – the difference being the shape of the guitar. Which does have a big impact on sound. But you can see now that it’s not that complicated to tell the difference between each of the X Series guitars. The GPCX1AE is the same as the GPX1AE above except that it has a cutaway. This is a great option if you like to reach the upper frets more easily. The only difference between the GPCX1RAE and the GPCX1AE is that the GPCX1RAE has rosewood patterned HPL back and sides in place of the mahogany patterned HPL back and sides. So the choice between the two will basically come down to which one you like the sound and look of better. The major difference between the GPCXAE Black and the GPCX1AE and GPCX1RAE is that it has a black HPL top in place of the solid Sitka Spruce top. This is why this guitar is cheaper than the GPCX1AE. It also has Black HPL back and sides. The GPCX2AE features a solid Sapele Top and Macassar patterned HPL back and sides. These are the major differences compared to the GPCX1AE and GPCX1RAE. Otherwise is basically the same. Sapele is similar to Mahogany. So if you prefer that sound then this could be a good option. The 00X1AE is very similar to the DX1AE and the GPX1AE. The major difference being the shape of the guitar. This is DX1RAE/GPX1AE but instead in the 00 shape. The 00 Shape is more like the Dreadnought in terms of its more subtle waist – but it’s quite a bit smaller. It is smaller than both the Dreadnought and the Grand Performance. It has a smaller overall length, smaller body length, smaller lower bout width and a shallower body depth. You can check out the dimensions below. As you can see the only real difference is the shape/size – which is, of course, a fairly significant difference. And again we have the same guitar in terms of materials – but this time in the 000 (aka 0M) shape. This shape looks more like the Grand Performance shape in terms of the shape – but it is smaller. However, it is bigger than the 00. Adding one more column to the table you can check out the 000 size compared with the Dreadnought, Grand Performance and 00 above. The OMXAE Black is similar to the 000X1AE. The major difference being the Black HPL top, back and sides. The HPL top in place of the solid Sitka Spruce top is the reason that it’s cheaper. The 0M shape is the same as the 000 shape. The other smaller differences are the black saddle and nut and black birch laminate neck. The OMCXAE Black is the same as the 0MXAE except that it has a cutaway for easier access to the higher frets. As you can see, a lot of the X series guitars are quite similar but are offered in different sizes/shapes, with different looks and a couple of different top wood options. So there should be one to suit most people looking for a guitar in this price range. Personally I wouldn’t go for any of the models with Black HPL tops – the only reason being that the equivalent model with a solid wood top is only an extra $50. So unless you are determined to get a black guitar then I would opt for one of the solid Sitka Spruce topped or Solid Sapele topped models (depending on your sound preferences). Thanks for reading and I hope you now know more about Martin’s X Series guitars. If you have any questions or comments feel free to leave them in the comments section below. My husband is a guitarist and to be honest I didn’t know that they are so many kinds of guitars! We have three guitars at home and I would like to add another one to our small collection. I have bookmarked your website so I can show this article to my husband, I am sure he will love it! Thanks for visiting. I’m glad you found the article helpful. Yeah there are thousands of acoustic guitars available out there. That’s why it’s helpful to group them in series like this. That way you know, for example the Martin X Series all share certain characteristics and then just differ in small ways. Always nice to add to your collection – and exciting to search for that new guitar. Enjoy! I found this post very informative and helpful. I am a music major in college, and my concentration is piano, but I am interested in learning the guitar. This fall I will be making soul themed music, which will require live guitar instrumentation. I would definitely take the Martin X series into consideration. Hi Nate, Great overview of the whole X series. I’ve been researching Martin-X guitars before hitting the store to try some. I’d like to narrow down the options first, rather than try everything and just get confused. You recommend paying the extra $50 for a Sitka Spruce top, rather than the Black laminate. Could you be a little more specific about the differences in tone between the two? Also, could you compare the other available tops (Sapelle and Macassar, I believe) to the sound from the Sitka Spruce top. I’ve listened to lots of Martin guitars with the Sitka Spruce top, of course, it’s iconic. I have to admit I prefer my Cedar-top Laskin. It’s just warmer and more mellow. So I’m open to alternatives. Good strategy to narrow down your options! Can get very confusing if you try too many at once. Personally I prefer the sound of solid wood but not all laminate wood is made the same – so some are better than others and I assume Martin make a quality laminate top. But for you I definitely recommend trying the Sapele topped versions. These will have a mellower/warmer tone than the Sitka Spruce tops. The sizes will make a big difference to the tone and feel as well. I would try a Sitka Spruce and a Sapele version and decide which you prefer. Once you find your preferred top you could then try the different sizes that that top comes in, if that makes sense. Firstly, I do find that a cutaway does affect the sound. It’s subtly but I find non-cutaway guitars produce a fuller sound when not plugged in. If you are going to be playing the guitar plugged in mostly, then the difference is very little and you can adjust the EQ to get the sound you want. Also, if you are not going to require access to the higher frets, then a non-cutaway is probably a better option – and usually cheaper. The significant difference between the DCX1AE Macassar and the DX1RAE, apart from the cutaway, is the back and sides material. The DCX1AE Macassar has laminate Macassar back and sides and the DX1RAE has laminate Rosewood back and sides. Because the back and sides are laminate the difference between the 2 types of wood won’t be significant but there will be a subtle difference in tone between the two. To be honest Macassar is a similar tonewood to Rosewood (strong bass, clear highs and scooped mids) – so there really won’t be a huge difference in the sound. You’d probably notice it more if they were both solid wood – but I don’t think there would be a huge difference in tone. I don’t think either will sound better than the other. They do look quite different though. I think the GP shape is a more balanced sound. So the low end will be less dominant. There is more mid range and just in general more balanced across the tonal spectrum – less bass heavy. Not quite as loud as a dreadnought, IMO, but pretty close. Still quite a big top – just with that more defined waist, there’s just slightly less top to be vibrating – but it will close to as loud as the Dreadnought. Certainly louder than the likes of the 00 and 000. Your responses are not accurate. THE HPL in the X series contains ZERO WOOD. It is a phenolic resin paper based laminated composite. The difference between the Rosewood HPL and the Madagascar HPL is that one has a Rosewood finish and the other a Madagascar finish, that is an imprinted, colored finish. NO WOOD is involved. So I’ve been toiling over three of these, but couldn’t find any direct comparison of the three ANYWHERE. Like nowhere and nobody could just tell me the simple differences. So…OMG thank you! This is a great, easy to follow article. You’re very welcome and thanks for your comments. Glad that you found the post helpful. Just bought the gpcx1rae, my first acoustic purchase since the frets of my old washburn tore up. This article helped me make sense of everything I was looking at. Good stuff, and the Grand plays great! Awesome to hear that you’re enjoying the gpcx1rae – great guitar’s IMO, the X series – and not too painful on the wallet! The only thing that I can tell you by serial number is that you have a 2013 model – i.e. it was built in 2013 (I’m assuming that you have a Martin based on the fact that you are commenting on this post). Otherwise I can’t tell you anything else about the guitar. If you can send through an image of it I might be able to determine the model. Also – on Martin Guitars the model number can usually also be found in the same place as the serial number. If you look inside the soundhole of the guitar and look towards the neck, then you should see two numbers. The bottom number will be the serial number and the top one should be the model number. Just got a gpcx1rae and I think for the money, it can’t be beat. Incredible feel and sound, plugged in and unplugged. I’ve owned a lot of guitars over the years but this is my first Martin. Just bought the GPX1AE.Its Awesome.and i wouldn’t have bought it unt i read your article. Glad you like the GPX1AE (I really like the guitars in this series too) and glad you find this article useful. With reference to your statement “So the choice between the two will basically come down to which one you like the sound and look of better.”, when comparing the mahogany an rosewood HPL versions. My understanding is that they should sound the exact same, as HPL is HPL and the “wood” pattern is just a photo pattern finish. Is it not the case that when all other features are identical, the mahogany or rosewood HPL variants in the X-series are identical in terms of sound? In my experience the laminate that is used does make a difference to the tone. That difference is more subtle compared to if you had solid wood back and sides, but there is still a detectable difference. I’ve tested this a couple of times, including with the Taylor 110ce and Taylor 210ce as per the post at the link below. >>Taylor 110 vs 210: Is there a Difference? Certainly not as much as the difference solid wood makes, but some difference none-the-less. Glad you like the GPCX1RAE – great guitars in the X series, especially for their price-tag. The laminate used for the back and sides of the X series Martin guitars is HPL and is the same material regardless of which “wood” version they print as a grain design. If you are hearing a difference in the Mahogany, or Rosewood HPL guitars with the same tops and specs, it is the sound of a photograph of different wood on the back and sides 😉 Or it might be a quality control issue resulting in identical builds sounding noticeably different. Either way, they all sound equally great to me. We can agree on that. I am just pointing this out, as it is best that buyers know exactly what they are getting before purchasing. Thanks again for a great article and very nice site. Thanks for your clarification. I haven’t directly tested guitars in this series with one type of HPL with another – I was basing it on other laminate woods from other guitars. The HPL that Martin uses must work differently to other laminates. But I am now definitely keen to play two x series guitars against each other (with all else being equal, shape, cutaway etc). Thanks again for clearing this up and thanks for visiting the site. Happy holidays! Hi, what is Martin X series “Custom” ? Thank you. Hi Nate, Came across your site and want to say thanks. 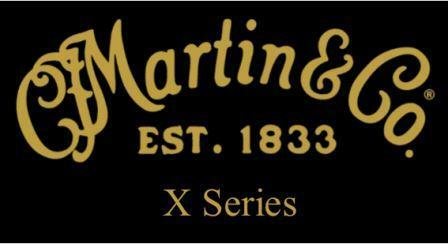 Very informative of the x series Martin’s and what all the letters mean. I bought mine I think back in 1999. I wasn’t sure what I was buying back then, I just knew I wanted a Martin that I could afford. So I saw your list with the different models in the series and mine was not listed. I have a DCXME. I presume it might be similar to the DCX1AE but with the HPL top instead of spruce. Since you didn’t list it, I assume it wasn’t one of the popular models, but it still says Martin on the headstock, and still plays fine to me. What do you think? Is my understanding of this model correct?